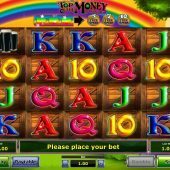 Top O' The Money slot originally started life in a slot machine, usually in a multi-game cabinet. It has since morphed into an online slot as we will see. Unfortunately this slot should have stayed in the back of the cabinet as it is unutterably dreadful in almost every way possible; from the stereotyped Irish theme, the game mechanics, the math model and the games' volatility. You don't even get the Novomatic sounds but an irksome tune as the game is played and exaggerated sounds as the reels stop, which along with all the corny icons made this an ordeal to test. Quickspin have very similar icons on their Leprechaun Hills game which can be forgiven as that slot is immeasurably better than this, which quite simply is top of nothing. You begin with a 5x4 grid of 20 pay lines which pay both ways i.e. from right-to-left too. The game has a cascade format which means every icon is a reel effectively, which frankly looks ridiculous as almost every spin throws in a full stack somewhere which you wouldn't expect to happen on a genuine cascade slot. There are also giant symbols which can appear anywhere in a 2x2 block of 4. Now when you hear how poor the pays are these block icons are no surprise at all: the game's logo pays 4x bet for 5-of-a-kind followed by the Leprechaun and the Pipe both paying 2.4x, the Guinness and Fiddle 1.6x and the 5 card values all 0.8x stake for a full line. You can see Shamrock Wilds on all 5 reels which don't multiply and you may thus have worked out that the top pay is a shockingly poor 80x bet for a full screen of Top O' The Money logos. There is a random in-play Colossal Reel feature whereby the Leprechaun may appear and spin a wheel for you with prizes of 1-50x bet on it of which you will collect at least 3 before he stops. Wow. As with most cascade-style games like Gonzo's Quest and Da Vinci Diamonds, winning icons are removed and replaced by more dropping down from above. Unfortunately there is no increasing multiplier here though, but you need 5 successive wins to fill the meter above the reels in order to earn 5 free spins, 6 wins will get you 7 free spins and 7 or more successive wins the maximum 10 free spins. During these free games the card icons can be overlaid with Shamrock Wilds in order to increase win frequency, and you can retrigger the free games by the same method of successive wins. You can't get the random Colossal Reel bonus in these games.